Not to be confused with Barrel Cannon Canyon. 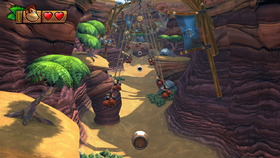 Cannon Canyon is the sixth level of Bright Savannah in Donkey Kong Country: Tropical Freeze. As the name implies, the level revolves around using Barrel Cannons to progress through the level. The level also makes extensive use of the dynamic camera angles introduced in this game. It is the shortest level in the game. Donkey Kong is launched by a Blast Barrel, avoiding two Hanging TNTs. At the start of the stage, Donkey Kong will cross multiple wooden platforms (Two Tucks and a DD Barrel can be found at the beginning). Here, he will find Hanging TNTs attached to moving ropes, the first of many found throughout the level. The Kongs will later enter the first set of Barrel Cannons, where they must launch past more Hanging TNTs with correct timing. Occasionally during the sequence, Archies will attempt to shoot fish at the Kongs, but miss. After launching from the final cannon, the Kongs will knock over a wooden tower (where the first checkpoint is located) and open the way to the next part of the level. In the next area, there are tree trunks in the background attached with explosives, which will detonate and cause the trunks to fall over and potentially hurt the Kongs. During the next series of Barrel Cannons, more of the same trunks will start to explode and slowly topple over onto the Barrel Cannon the Kongs are currently occupying, meaning they must launch themselves out before they destroy it. Occasionally, the Barrel Cannon will change angles, in which case the Kongs must quickly launch in the correct path. Eventually, the Kongs will reach a canyon with the Barrel Cannons directed towards the background, where more Hanging TNTs are found. The final cannon puts the Kongs on a wooden platform with the Slot Machine Barrel. K: Above a swinging Hanging TNT before the first Barrel Cannon. O: Between two wooden platforms shortly after the first checkpoint. N: When the Kongs reach a Barrel Cannon positioned above water, a green Finley will leap out of the water along with the letter "N", before they both go back in. The Kongs must launch as the Finley jumps out. G: Among the Hanging TNTs that spin in a carousel-like fashion before the Slot Machine Barrel. The Kongs must launch at the right time to collect it. Donkey Kong breaks a wooden plate to access the bonus room concealing the third Puzzle Piece. Among the wooden platforms at the beginning of the level, there is a high platform that is reached by jumping on a nearby Tuck. To the left of it is a secret entrance to a Bonus Area containing the Puzzle Piece. Just before the Kongs launch past the Hanging TNTs that move vertically up and down, the Puzzle Piece will appear coming down along the second rope. The Kongs must collect it as they launch towards the Auto-Fire Barrel at the right time before it disappears off the screen. Just past the first checkpoint, there is a Boom Bird carrying a Watermelon Fuse Bomb. After defeating it, Donkey Kong must carry the bomb and head back to find a wooden plate under the collapsed tower and throw it at it, opening an entrance to another Bonus Area with the Puzzle Piece. In a concealed area under where the Boom Bird was walking, accessed by pounding a panel on the right. Underneath the platform with the Slot Machine Barrel, obtained by entering a Barrel Cannon found on the left. The level was originally known as Cannon Canyons and was going to be World 2-6, but this was changed in the final version. ↑ GameSpot (June 13, 2013). Donkey Kong Country: Tropical Freeze - E3 2013 Stage Demo. YouTube. Retrieved June 12, 2017. This page was last edited on April 15, 2019, at 12:32.